Hello fellow cardsmiths, it's been awhile since we've started a thread for something other than a contest. As such, we wanted to see your cards relating to other smiths and special people in your lives. Here's our new card to get this train moving! I have created lore for her and everything, also in my opinion just a cool card. I had a cat who would follow me everywhere. 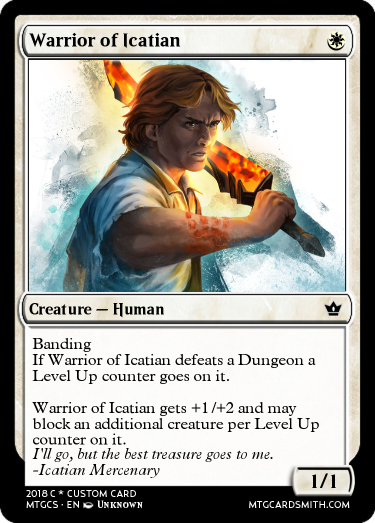 We'll be making some more friend themed cards to post here as a way to provide content. Probably a dog or bearded dragon card as well. Wow, it's been a while. Might have to make some cards! Technically about someone I care about. 3) keeps you from losing from not drawing a card because the draw pile and discard pile are combined in the exile zone. 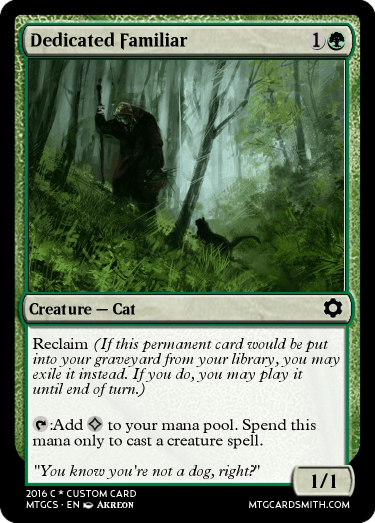 4) grants the possibility of re-using cards in the exile zone that are not usually available to regrow. 5) nullify “draw a card” abilities and the card draw during your draw step. To me, that doesn’t feel like a lot for nine mana. @Scott_Anderson Yeah I was at a loss for how to price the card because it does a lot of things that aren't seen in magic, and does one thing that magic kind of doesn't want to happen, which is moving stuff from exile back into the game. It does protect you from a bunch of nonstandard stuff, and gets you back anything you own that gots swords'd or path'd. Figured it would be better to have a jank mythic than some pushed card that everyone plays. Any suggestions for an alternate price? 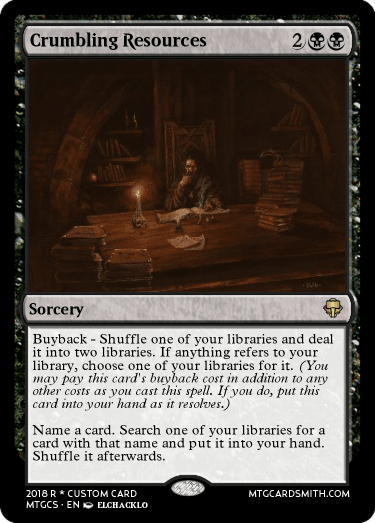 My suggestion is that this would already be a bulk rare until such time as exile-tutoring becomes a thing. So it doesn’t need to be prohibitively expensive CMC wise. It does feel incredibly blue though. My suggestion is 3UUU. What do you think? EDIT: Ring of Ma’ruf of course. Sorry. Just thought of a hilarious downside to that effect. Anything that puts stuff into your library kind of becomes the "new exile", since you almost have no way of getting something out of your library except for tutors. So tuck effects become more powerful. The first is my best friend, and the second is the both of us.